Drs. Lee Rasamny and Michelle Shirak assist in performing an awake blind nasal intubation on a patient with a difficult airway. 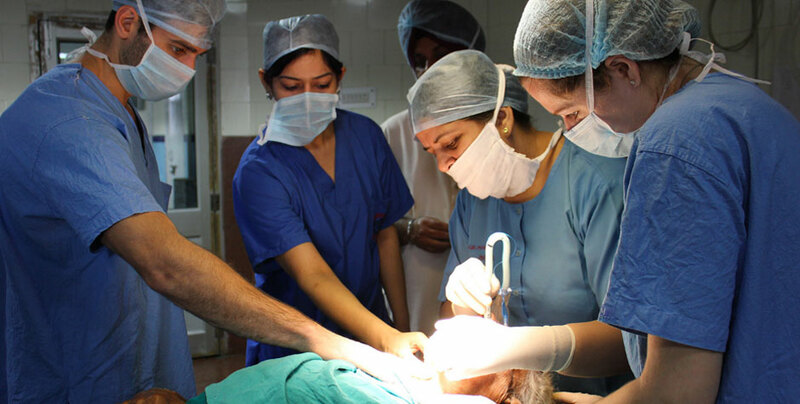 Our flagship residency programs take place in Rwanda and in India, and engage Cornell Anesthesia residents, fellows and faculty in international health issues, both as physicians and as globally-conscious individuals. Both of these fully-funded experiences are Graduate Medical Education (GME) approved rotations. Additionally, the American Board of Anesthesiology grants credit while on the rotation toward the 36-month continuum of training in anesthesiology. Therefore, participating resident physicians do not need to use vacation time to participate in these electives. During the mornings, faculty and residents actively participate in the medical care of patients or engage in education and training. Participants have an opportunity to spend time in the PACU and ICUs, and to participate in daily bi-directional teaching with our colleagues. Interesting anesthetic management of patients includes maintenance with halothane, anesthesia without opiates, laparoscopy under neuraxial techniques, peripheral nerve blocks without ultrasound, and difficult airways including patients with cleft palates and severe burn contractures. The global health training portion of the elective is robust. Major programmatic focus areas include agriculture, the environment, human rights, gender studies, and development economics. Each of these areas is inextricably intertwined with health issues and only by understanding the economic, environmental, social and political milieu in which one is working will participation be responsible. For example, educational sessions include meeting employees of a human rights organization, time with social justice activists in the rural countryside, and visiting women’s economic collectives with an organization run by social entrepreneurs. This multifaceted approach to global health education allows physicians to achieve a holistic understanding of the issues that contribute to ill health and disease. Paul Farmer, Jim Kim, Arthur Kleinman, Matthew Basilico. Reimagining Global Health. University of California Press, 2013. Preface and Introduction. Feierman S, Kleinman A, Steward K, Farmer P, Sas V. "Anthropology, Knowledge Flows, and Global Health." Global Public Health. 5(2): 122-128, 2010. Helene Cooper. "Ebola's Cultural Casualty: Hugs in Hands-on Liberia." The New York Times. October 4, 2014. The course syllabus is an interactive, multi-touch book on the iPad. The Department of Anesthesiology at Weill Cornell Medical College is dedicated to developing the careers of anesthesiologists committed to academic global health work. The goal of the residency Global Health Track is to provide a select group of residents an advanced foundation and knowledge in global health and global anesthesia. The mechanism for this is to provide a dedicated curriculum during residency for specialty education, mentorship, and a scholarly pursuit project in global health. The Global Health Track involves six weeks of extracurricular mentored training and education in global health during the CA-2 year. During the CA-3 year, the selected resident will either travel to India in the Spring or Fall Global Health Elective as one of four resident participants, travel to another programmatically developed global health site, or travel to an alternative global health site that is approved by the department; a global health scholarly pursuit project is to be completed in the CA-3 year; if the global health scholarly pursuit warrants, there is a possibility of receiving research time in the CA-3 year. Completion of a scholarly pursuit project at the end of the CA-3 academic time with at least one poster or presentation at a national meeting in anesthesiology or global health, and ideally leading to submission of a manuscript. Progress to each stage in the Global Health Track is contingent upon satisfactory progress in the preceding stage. Selection will be based on these items as well as on demonstrated interest in pursuing global health research. Only residents in good standing in the Residency Program based on Clinical Competence Committee evaluation, ITE scores, and faculty evaluations will be eligible and considered for the position. Entry into the Global Health Track position begins July 1 of the CA-2 academic year. Prospective applicants who wish to discuss their scholarly pursuit interests for the residency Global Health Track position should contact Dr. Sheida Tabaie at stb9054@med.cornell.edu. Support for national meeting attendance will be available to those who are presenting their original research as a first author at the ASA or AUA. Capably practice anesthesiology in varied environments (developing world health care system, rural medicine, rehabilitation centers). Effectively practice anesthesiology in a setting of limited resources. Be able to manage patients with a different constellation of diseases. Gain a broader understanding of medical illnesses by encountering patients with unique diseases. Provide care with alternate pharmacotherapy, anesthetic techniques, and pain management plans. Appreciate the economic, social, political, and environmental factors that influence health and access to healthcare. Practice anesthesiology in a vastly different environment which provides unparalleled opportunity for personal reflection, growth, and development. Through an improved understanding of how other health care systems work, be introspective as to how medicine is practiced at home. Utilize the knowledge, skills, and adaptability gained as a result of participation in this elective to improve their practice of anesthesiology. Develop cultural sensitivity through the cultural immersion that is the essence of this elective. Establish important professional relationships with health care providers, human rights workers, and social activists. Be organized and timely with deadlines so as to have a contextual foundation by engaging with the elective syllabus by the beginning of the elective. Understand their role as guests in a foreign hospital and country. Use their experiences during the elective to improve conditions on the ground or at home via research, implementation programming, and solution building.